It is time like this I really do reflect on the past- truly, if it wasn’t for the likes of my Grandad and many other British and American troops as well as the Australians, Gherkers, and the rest of our allies, I for once know i would not be here and probably speaking a different language. Just take ONE minute to stand and think about what these people did for us, they gave it all and many gave their lives so we can live free today. Some 70 years now and it is still a vivid memory for me of all I learnt at school and from veterans of what they went through. You can call me what ever you want, but these people are my true heroes and I thank you all and will do every Memorial day. 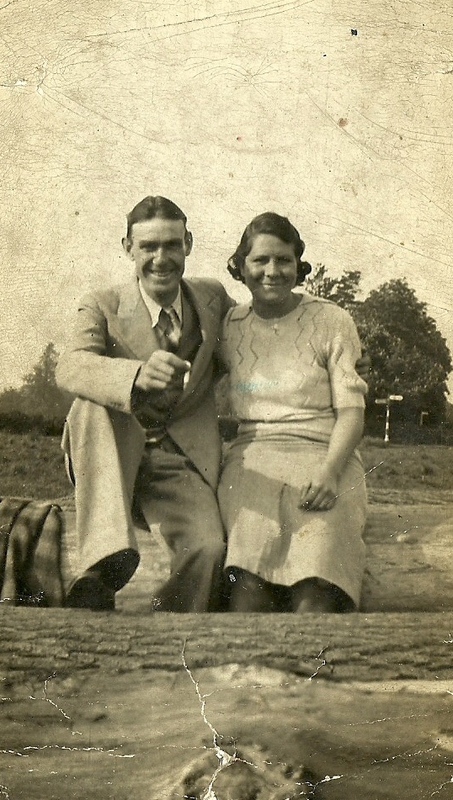 Thanks Grandad, sitting on a Bofor gun firing flak up to the Bombers as the dropped on you in London is something I will always remember and be proud of my Grandad Hall for doing his bit and as this poem, says it all. I remember when I was just a kid, Grandad Hall said to me, and this was the only thing I ever heard from him about the War, was Ode of remembrance, it did not mean anything to me as a kid, but this was first written after WW1 and so true. The “Ode of Remembrance” is an ode taken from Laurence Binyon‘s poem, “For the Fallen“, which was first published in The Times in September 1914. On 6 June 1944, just after midnight, the Allied assault upon Hitler’s ‘Fortress Europe’ began. The operation caught the German military high command unaware. Low tides and bad weather – combined with Allied deception plans – had convinced the Germans that an attack was unlikely at that time. As more than 1,000 British bombers began to pummel Normandy’s coastal defences, Rommel, commanding German defences in France, was in Germany celebrating his wife’s birthday. Early Allied success was aided by the confused German reaction. The first confirmation of a large-scale attack did not arrive until 2:15 am; that an invasion was in progress was not confirmed until 4:15. It was only at 6 am, when Normandy’s defenders saw the horizon obscured by an unbroken line of Allied ships, that all doubt was removed. Along nearly 100 kilometres of coast, Allied warships and aircraft pounded German defences. 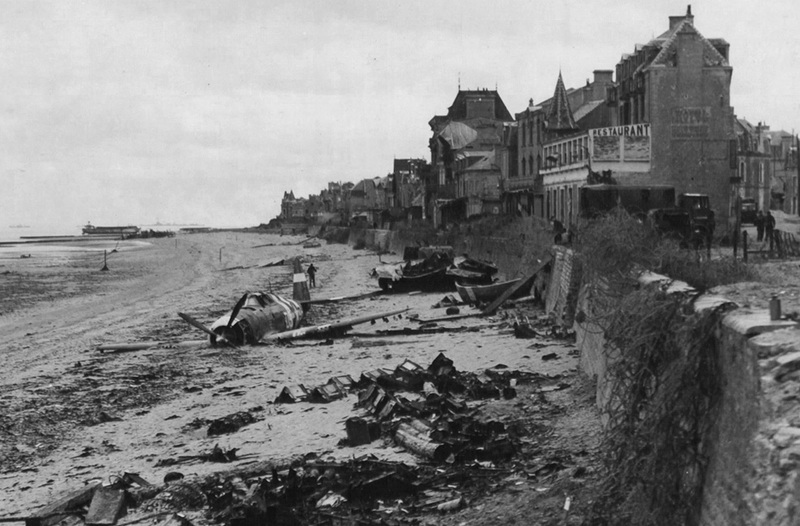 At 6:30, US soldiers went ashore by landing craft at Utah and Omaha beaches. An hour later, the British and Canadians arrived at the beaches of Gold, Juno and Sword. Fortuitously, troops at Utah accidently landed two kilometres from their target, on a virtually unguarded beach. The landing zone was quickly secured with few losses. 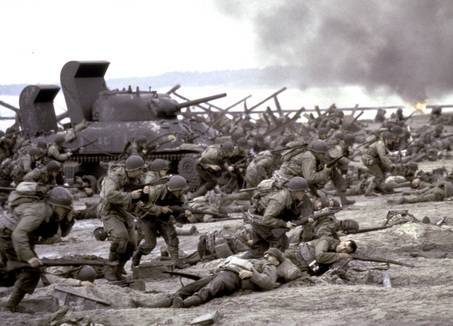 On Omaha Beach, where aerial bombardment had done little to dent German defences, the Americans met fierce resistance. From cliff-top bunkers, the defenders pummelled US troops with machine gun fire and shells as soon as landing craft ramps were lowered. Those who made it ashore found it impossible to advance across 200 metres of open beach. Amphibious tanks intended to cover the infantry’s advance had sunk in the rough seas. The news from Omaha was so bad that the landings there were almost called off, but eventually small groups of American infantry worked their way around the German defences, outflanked and stormed them, allowing the beachhead to be secured. But Omaha cost the Americans more than 2,000 casualties. When British and Canadian troops landed at 7.30, supported by tanks, the tide was high, leaving fewer metres of beach to traverse. Although mines sunk a number of boats, soldiers succeeded in silencing German machine guns within half an hour. At the day’s end, although they had not yet taken their objective of Caen, the soldiers had penetrated six kilometres inland, and their foothold in Normandy was secure. At 6pm, when Churchill addressed the House of Commons, it was to announce the astounding success of an operation which would go down in military legend. In the military, D-Day is the day on which a combat attack or operation is to be initiated. The best known D-Day is June 6, 1944 — the day of the Normandy landings — initiating the Western Allied effort to liberate mainland Europe from Nazi occupation during World War II. 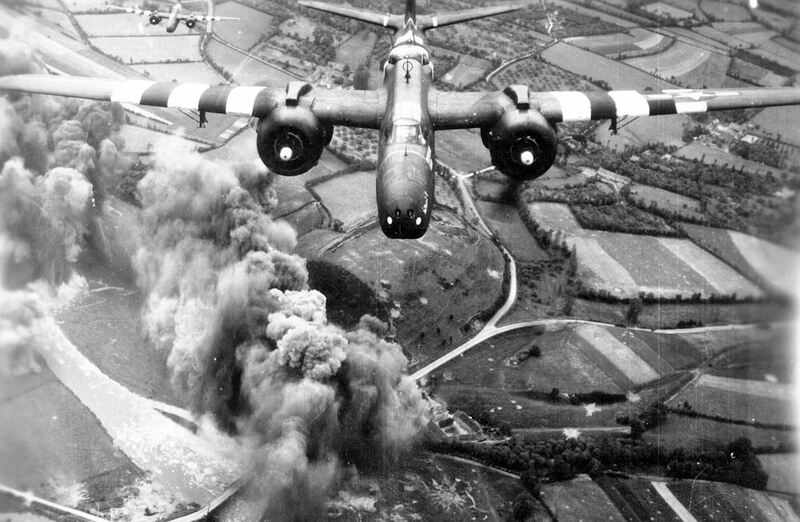 However, many other invasions and operations had a designated D-Day, both before and after that operation. Other days such as A-Day (Battle of Leyte), L-Day (Battle of Okinawa) etc. have different meanings for the military. Jumping into a swelling, cold sea and under fire, I cannot believe the bravery of each and every person that had to do this. Brothers in arms, risking their lives to save others. Still smiling when bullets are flying! Normandy landings, no real words can explain what was actually going on in their minds but so brave to face the enemy. Clearing the way for the troops to invade. It is these people that WE owe our liberty too and I thank you all. 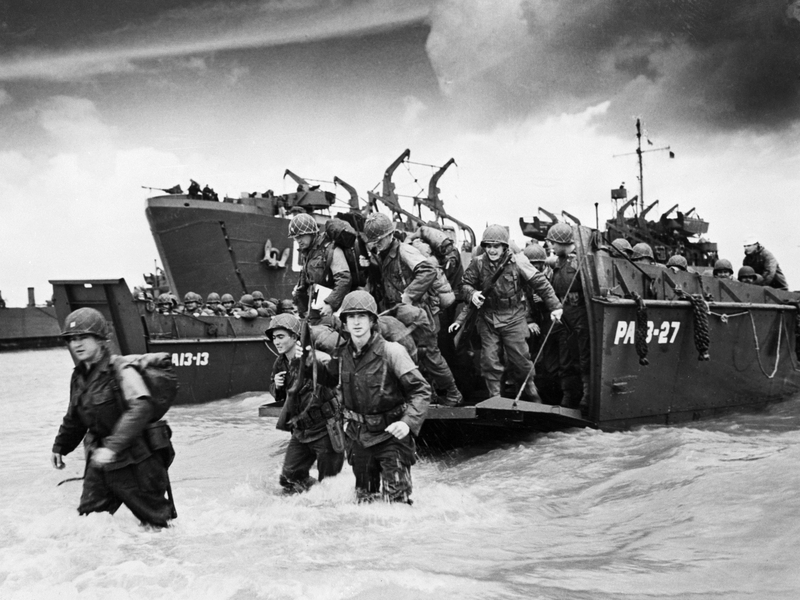 The Normandy landings were the largest amphibious operation in history. In one day, 175,000 troops landed on the Normandy coast, with the help of more than 5,000 ships, crewed by 195,700 personnel from the Allied navies and merchant navies. This entry was posted in Blog and tagged 8th air force, airforce, airman, army, bombers fighters, british forces, d-day, memorial ww2, navy, remeberance day, sailors, soldier, troops, united kingdom, united states.